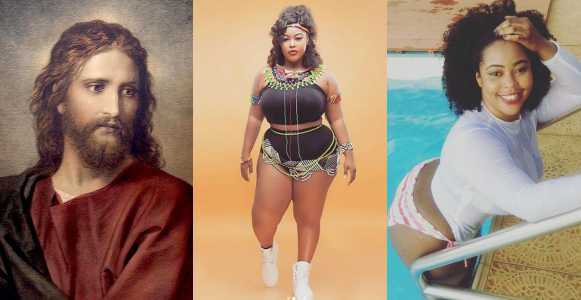 Ghanaian songstress and actress, Nana Frema Koranteng claims Jesus Christ was one of the first people to perform a “plastic surgery” during his time on earth. She made this known in reaction to a statement by a former highlife artiste turned Evangelist, Papa Shee. Papa Shee believes people who go in for plastic surgery have committed a grievous sin and will end up in hell, and has therefore advised Ghanaians, particularly women, to desist from such practice. Reacting to the statememt, Nana Frema who once publicly admitted to have undergone surgery to gain a curvy shape, kicked against the evangelist’s warning. In an interview with Kwame Adjetia on Neat FM’s Entertainment Ghana show, Mana Frema stated that Jesus Christ was the first person to perform plastic surgery done on a human being. “Jesus Christ did a plastic surgery. Somebody’s ears were cut off and he fixed it. It was surgery. God is the one who has given doctors the knowledge”.